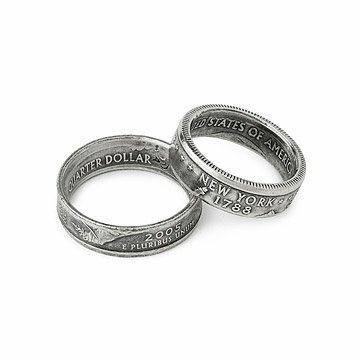 These rings are made from commemorative state quarters, cleverly reshaped and plated in silver. These rings are transformed from ordinary pocket change into an altered state. Commemorative state quarters are punched out and then re-worked into these richly detailed rings. The rings are then silver plated, which gives them an added patina. A unique way to display your local pride, you can request the state quarter of your choice, and its name and statehood year are visible on the outer surface. Because the quarters were only minted for ten weeks each, choice of issuance year is not available. Handmade in California. Now available: US Territories, see drop down list for specifics. Sizes 3-9.5 available, including half sizes. My husband loved this unique and custom made Indiana quarter ring!! He wears it as his wedding ring and gets tons of compliments! Fit true to size. This ring is my favorite. It's comfortable and really cool looking. I own over 20 rings and this is my absolute favorite. I wear it every day as my wedding band. I have many rings that I use as wedding bands, but since I got this ring they've all sat in a box. I highly suggest this ring. I got the the state that I was born in and you can totally tell this used to be a state quarter. Get this ring if you want something unique and very comfortable. I do golf course maintenance and I am very hard on jewelry. I thought this would be the perfect replacement for my diamond wedding set. It is a nice ring - just OK. I was disappointed that the size 6 is too large. I am thinking your sizing measurements are off slightly. I was just to my jewelry to have my rings repaired so I purposely had my finger sized so that I purchased the correct size from you. My husband collects coins so I thought this would be a unique anniversary gift. However; it was a wee bit disappointing. It just didn't look as good as the pictures. Love My Nebraska State Quarter Ring! I love my Nebraska state quarter ring. It's very unique. It looks delicate, but it's very sturdy. Unless someone asks to see the ring up close it's not obvious that the lovely design and coin edge are actually a former quarter, but upon closer inspection it becomes very clear that it's former life was a coin!!! Every detail is very clear, and it sits easily upon the finger. I think anyone who has a "favorite" state would LOVE to have this unique way of displaying their pride on their hand. I bought the largest size available (9.5) and the ring is still legible. It took a moment for my husband to figure it out but once he realized what it was, he was impressed. He typically doesn't wear jewelry other than his wedding ring, but thought it was such a neat idea and clever product that he wears his state ring proudly everyday. We've only had the ring for a short while, but no issues so far. Right now, I would absolutely recommend this product. This artist has coined a winner! My husband adored this ring and he's not a big fan of wearing rings or any kind of jewelry. But this ring is very meaningful to him as a coin collector. Definitely a State-of-the-Art dude ring.